Free! Seating is limited to 200 girls; reservations are required. The Girls of Promise® Summer Coding Camp is open to 6th to 12th grade female students interested in coding. Open to novices and experienced coders. The max capacity is 200 girls. WFA’s staff, board of directors, and event committee are so appreciative of everyone who help make this event possible. 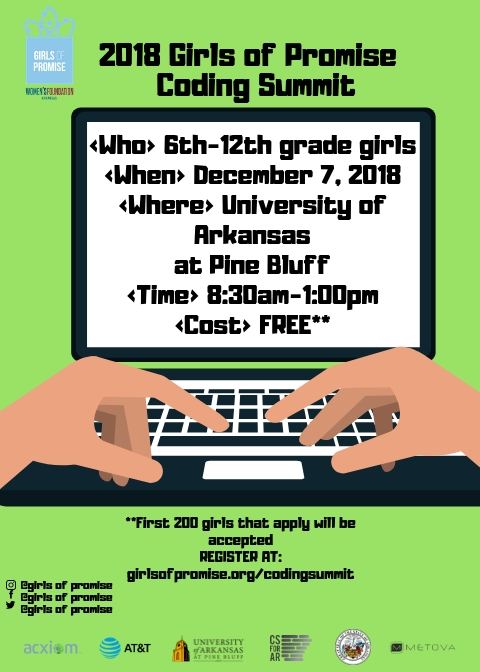 Thank you to AT&T, Acxiom, Governor Asa Hutchinson, Metova, and the UAPB Stem Center for making this Coding Summit possible.